In a time of never-ending transition, Pakistan keeps producing exceptional cricketing talent, except in one category - opening batsmen. But just when they seem to have settled on a reasonably settled combination at the top of the order - Mohammad Hafeez and Ahmed Shehzad average 51.14 as an opening pair - a third name has staked a powerful claim for a long-term berth with a match-turning and potentially match-winning century. Imran Khan, the Pakistan fast bowler, has said his maiden five-wicket haul in Sri Lanka's second innings has given his international career a major boost. He said he and his team never gave up, even after three bad days, and this belief was behind their turnaround on day four of the Pallekele Test. Imran wrapped up Sri Lanka's five remaining wickets in the morning session, ensuring they wouldn't stretch their lead past 400. 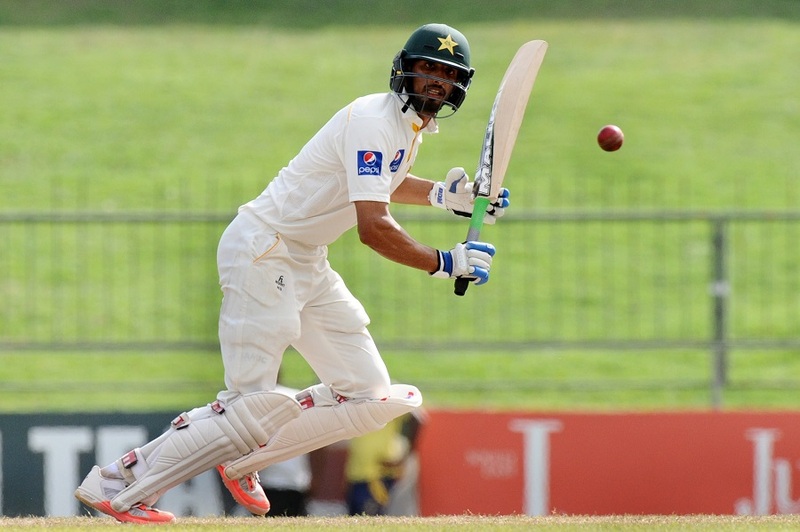 Pakistan were 230 for 2 at stumps, leaving them 147 to get on the final day. "We had a simple plan to bowl in the right areas," Imran said. "I am happy that I was able to contribute with a five-wicket haul, which was a dream come true. I think my international career starts now with this performance. "I always admired Umar [Gul] bhai, who has been my idol and supported me a lot. And Waqar [Younis] and Mushy bhai [Mushtaq Ahmed] are now working a lot with me, helping me thrive. I had fitness issues in the past and I want to thank [Grant] Luden [Pakistan's fitness trainer] who worked really hard on this aspect." On Pakistan's unexpected batting display, Imran said: "the team was given a lot of confidence back in the dressing room, recalling our run feast against Australia and New Zealand last year, and that was the major driving force for the batsmen. The ability was always there but they were lacking confidence and the team management give ample motivation to make this happen." When Shan Masood and Younis Khan joined hands, Pakistan were 13 for 2 and their target of 377 had begun to flicker out of sight on the horizon. At the end of day four, both batsmen were still undefeated. They had put on Pakistan's highest-ever fourth-innings partnership. Younis had become the first batsman to make five fourth-innings centuries in Test cricket; Masood had become only the fifth Pakistan batsman to score his maiden Test hundred in the fourth innings. Born in Kuwait, Shan was only three years old when his family was forced to leave the country amid the Gulf war in 1991. They shifted to the United States. He spent two years there before moving again, to his native country Pakistan. His journey wasn't over yet, though; he was sent to Stamford School in England, and scored 1237 runs for them during the 2009 season. He had come extremely close to the schoolboy record of another left-handed opener, Alastair Cook, who scored 1287 runs for Bedford in 2003. Within Pakistan, Masood's selection has been viewed with a certain degree of scepticism, due to his privileged background and connections - his uncle holds a powerful post in the government, while his father is part of the PCB governing board. But he can always retort that he was only called up when his performances merited it. After four unspectacular seasons in domestic first-class cricket back home, Masood blossomed in 2012-13, scoring over 1000 runs for the season. He was called up to replace Mohammad Hafeez, who was axed after the Zimbabwe series in 2013. After making a solid 75 on debut against South Africa, Masood had been a regular part of Pakistan's Test squads, even if opportunities to play in their XI were scattered. Even his chance to play in Pallekele only materialised because Hafeez had to get his bowling action tested. Masood endured periods of struggle during his innings, especially early on. The first ball he faced was a Dhammika Prasad jaffa that opened him up completely, and it took him 14 balls to get off the mark. But he soon got going, and a flowing straight drive off Prasad in the fifth over was a sign of what Sri Lanka could expect from him through the rest of the day. Generally sure outside off, where he left well, he was occasionally troubled by the incoming ball or the ones banged in short, but he grew increasingly secure in Younis' company. He opened out when spin came on, and he used his feet to pick up two fours off one Kaushal Silva over. The fifty came up with a single off Kaushal, and later, the big landmark came up with the biggest shot of his innings, a straight six into the sightscreen, also off Kaushal. Against the offspinner, Masood picked up 52 runs off 63 balls, and to a great extent neutralised a bowler who was expected to provide Sri Lanka a fair amount of their fourth-innings threat. Against the seamers, Masood was more circumspect, scoring 56 runs off 130 balls - it showed he was aware of his own game and his confidence in that game: that of an old-fashioned English-style opener. His partnership with Younis was built on the familiarity of playing together for Habib Bank Limited. Younis, who scored his 30th Test hundred, has been involved in 60 century stands with 19 different partners, and he always makes life easier for his partner. No career is guaranteed in Pakistan, and the life of an opener is particularly insecure. Masood, though not a regular in the eleven yet, has been in the scheme of things for a couple of years, and in the squad for several series. He is technically solid - he credits his English cricketing upbringing for this - and is one of the fittest players in the Pakistan circuit according to a recent PCB fitness test report. It might be premature to say that Pakistan have found the genuine article, but with Hafeez now 34 - and with Younis and Misbah-ul-Haq approaching the end of their careers in the middle order - Masood has a genuine shot at making one of the opening slots his own.